^ a b c "The Q Awards". Everyhit.com. Retrieved on 24 August 2009. ^ Jury, Louise. "Take That voted best, worst and most tragic". The Independent. 4 December 1995. Retrieved 24 August 2009. 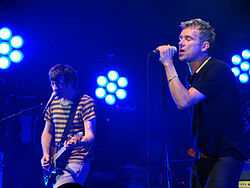 ^ "Blur blitz the Brits with haul of four awards". The Independent. 21 February 1995. Retrieved on 24 August 2009. ^ a b "Blur's award hat-trick". BBC. 1 February 2000. Retrieved on 24 August 2009. ^ "Rock veterans honoured at awards". BBC. 3 November 1999. Retrieved on 24 August 2009. 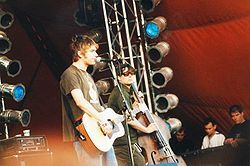 ^ "Mojos 2009: Blur reunite to collect award". The Daily Telegraph. 11 June 2009. Retrieved on 24 August 2009. ^ Jonze, Tom (24 February 2010). "NME awards 2010: Kasabian, Muse and ... Catchphrase?". The Guardian. Retrieved on 25 February 2010.